Having guests can be stressful. All the cleaning, planning, and hosting can take a toll on someone. Fortunately for me, I love it! I love to have people stay in my home and I love to pamper them. Unfortunately since we just built our house we didn't have a lot to spend on a new guest room; a room that would be used once or twice a year. Knowing that I only had a few short weeks to set up a luxurious space for my guests on a shoes string budget I got to work planning. 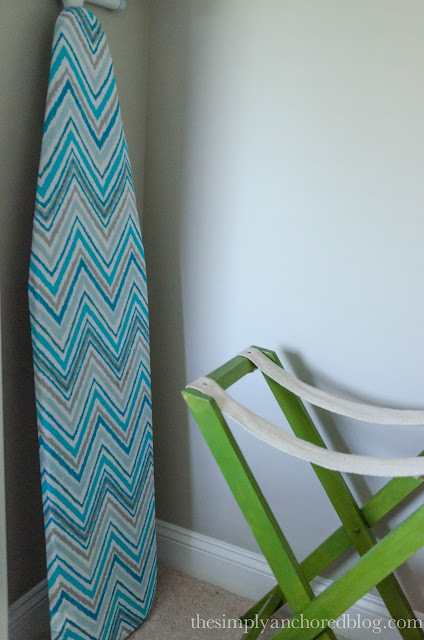 I knew the essentials of a guest room and I knew what I could repurpose and what I had to go out and buy. A welcome stand is a great idea for any guest room. 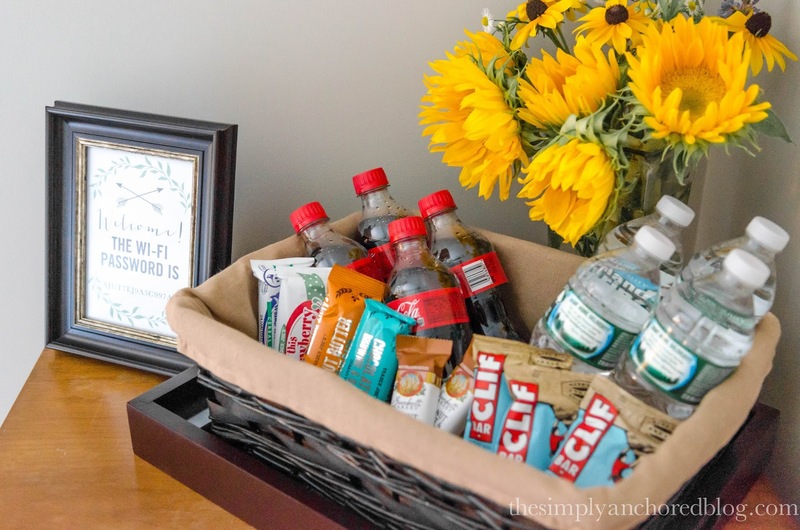 This is the place to put a little basket of late night snacks so your guests don't have to rummage through your kitchen in the dark if they get hungry. Accompanied by waters and other sealed beverages. In my guest room, the welcome stand is the first thing the guest see's when they walk into the room. It makes them feel, well, welcomed! Adding some fresh flowers the day before their arrival is a nice touch, too. I bought some sunflowers at Trader Joes then added some wild flowers from the yard for a local touch. Sewing Desk - from my office - Free! Don't you hate going to someone's house and having to ask for the password just to find out it's a 16-digit password of random letters and numbers and that they have to scour through their filing cabinet to find it for you? Every bed needs a nightstand. Our guest room is small so we could only add one. I didn't have a "proper" night stand, and I was happy about that since they can be boring! I went to HomeGoods and picked up this magazine organizer, flipped it on its end and tada! 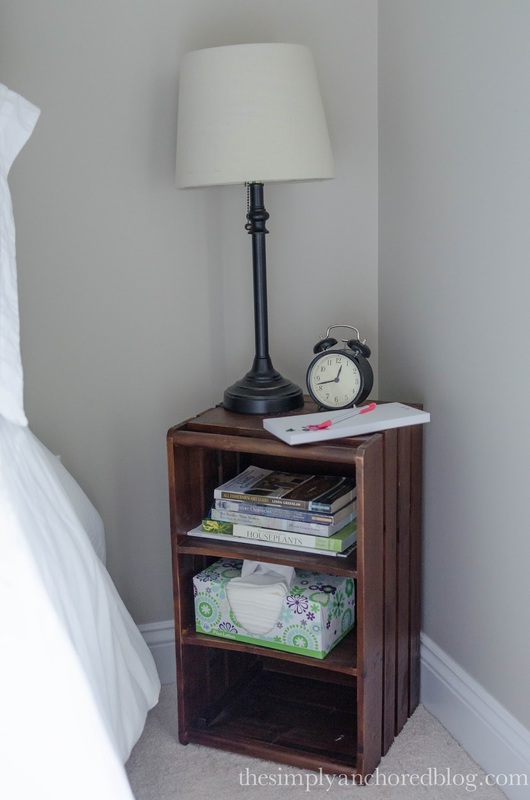 a beautiful nightstand that has ample storage. And one that I can repourpose somewhere else in the house after! I added a light, which I just took from my own nightstand in my room to save money (so we just used my husbands light while guests were here). Then I added a small clock. I love wall clocks or table clocks more so than cellphones. You don't have to press any buttons, the light won't blind you in the wee morning, and they not only act as a time teller but as decor as well! 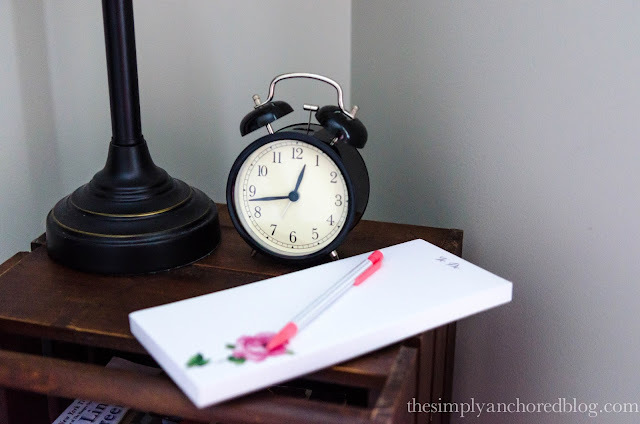 Lastly, add a notepad and writing utensil. You never know what the guest might need to write down at any given moment. Then toss in a few books and a box of tissues. This will fill out the night stand nicely but will leave enough room for a cellphone to charge or a pair of glasses to be set down. 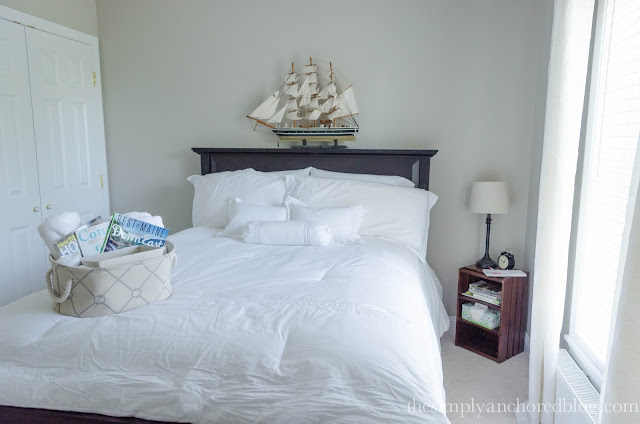 White linens are essential for any guest room. You might cringe at white because they could get dirty but the great thing about white is it is bleachable! It also gives the room such a clean crisp feel. 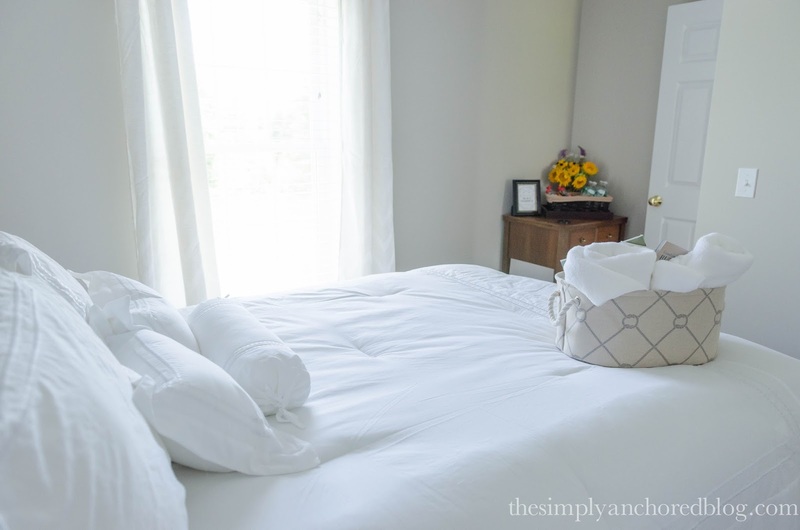 For the sheets, pick up a set of sheets that have a thread count that is 500 or higher. I found beautiful 800 thread count sheets for a good price at HomeGoods. For the comforter, that I also picked up at HomeGoods, I made that white for the same reason. Easy to clean and stunning to the eye. TIP: If you have a Queen size guest bed, buy a KING comforter set and turn it sideways. This will eliminate the need for a bed skirt since it will hang down the sides and if you have guests who are cover-hogs, it will give both guests enough coverage at night! .... and I can use it on my king bed after the guests leave! Whenever I go out of town I always forget at least one bathroom item. Usually it's Q-tips or aspirin or something. Knowing that I am not the only one who does, I made sure to stock up on travel items. 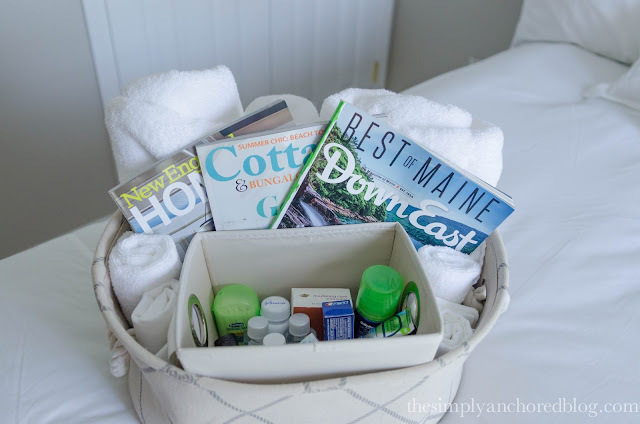 I also included brand new white towels since our every day towels have become dingy. And again, white, so they can be bleached. Then I tossed in a few local magazines! Since my guest room is small there really wasn't a place for the guests to place their suitcase and I didn't have a dresser for them to place their clothes in. To save money, I asked my mother if I could borrow her luggage rack and I placed it in the closet along with ample hangers. 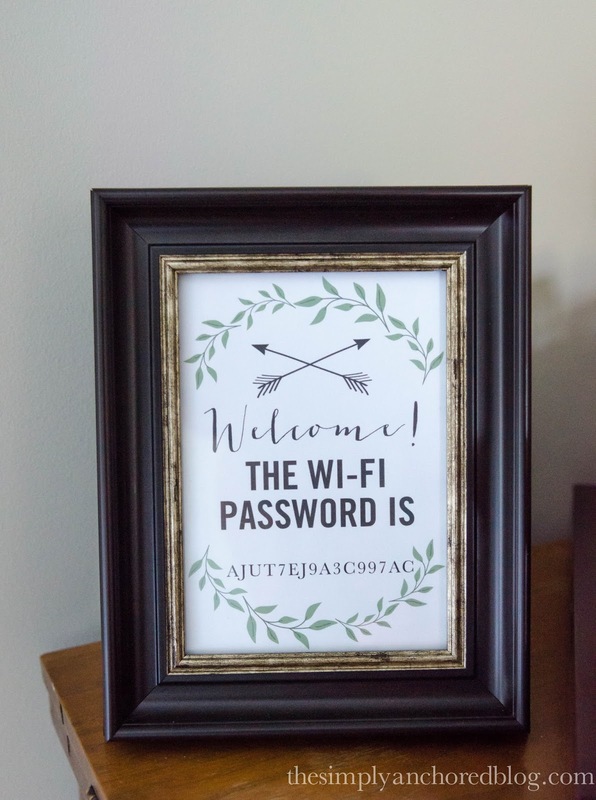 It worked perfectly for the guests and saved money since I just borrowed it for a few days! And because my guests have suitcases, you know their clothes will eventually need to iron something. Now, most people have an ironing board, we did not! I had been ironing on my countertop! So my husband ran out to Wal*Mart and picked one up for $14 and we just placed it in the closet for their convenience. Now that all the essentials are taken care of it's time to add a personal touch. I like to add something that has meaning to the guest. We placed this beautiful ship that our guests had given us for a wedding gift above the bed. 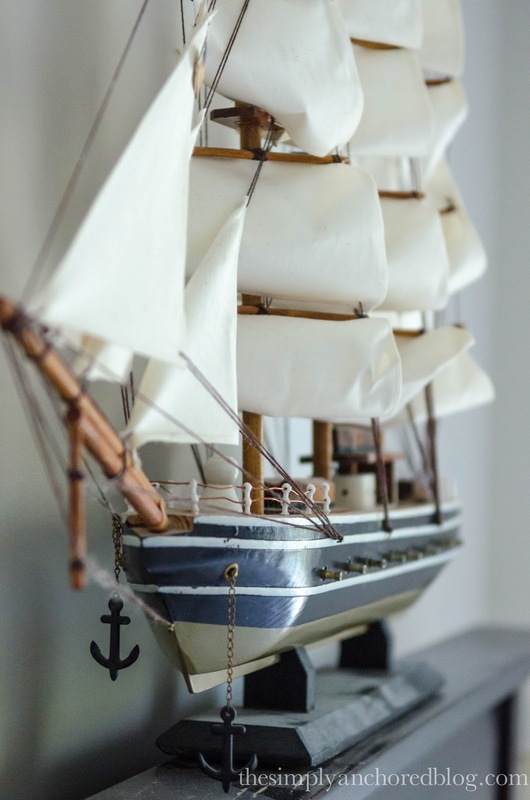 Not only did it look amazing in the room, it meant something to both the guests and us! Just because you don't have a ton of money or a large room doesn't mean you can't have a beautifully decorated and functional guest room. 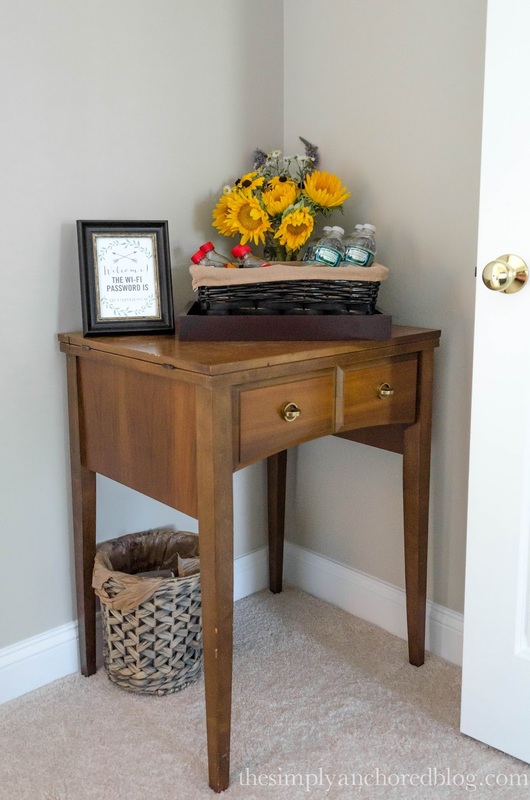 Look around your house and see what you can temporarily use in the guest room (like moving a side table from your office in for a welcome table, or giving up a lamp from your room for a few days instead of buying a new one). "Wow! This is like a 5 Star hotel, not a guest room!" Love those ideas! I'm going to have to make some additions to our guest room! Thanks! Either choose a wall for the pattern or just a part of the wall and create a perfect conversation piece in the living room. You do not have to stick to simple lines. Keep your turn as calm as conceivable so your companions can really make the most of their chance with you. Regularly the move turns into a loathsome ordeal for everybody included, including the general population that are only there to help.